When we were in Southern Germany, we had to stop at a service station to air up one of our rental van's front tires. The service station was adjacent to a VW dealership in a tiny town of about 500 residents. This is the mechanic's sweet ride. 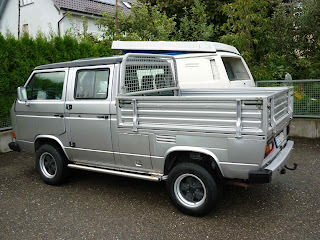 Why this silver streak is a "T3" Transporter "Doka" (double cab). Nicely outfitted with Porsche Fuchs alloy wheels (and a leather-wrapped Porsche steering wheel to boot). 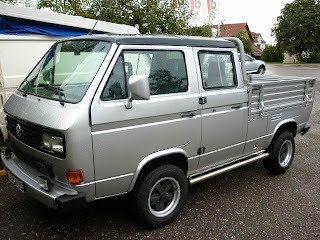 My boss (a multiple time Doka owner) was drooling at this specimen. Nice color too!